Louise Campbell was born in Copenhagen in 1970. Being the daughter of a Danish father and an English mother, she grew up and was educated in both countries. After graduating from the London College of Furniture in 1992, she returned to Denmark and continued her studies in Industrial Design at Denmark's Design School, graduating from here in 1995. She set up her own studio in 1996, from where she has worked independently since. Her main focus is on furniture and lighting design, but the studio is increasingly involved in product and interior design projects as well. Louise Campbell’s work is playful and experimental, and is increasingly gaining a reputation for gently twisting not only every day objects and situations, but also materials and manufacturing processes in new directions. The combination of Scandinavian rationalism and femininity, and perhaps her dual nationality, give the works of Louise Campbell an unusual edge. Illustrating contrasts seem to be an issue that keeps returning in her work. The studio is also known for its interest in less commercial activities. Apart from being the curator and designer of exhibitions, Louise Campbell has taken part in numerous activities aiming at improving the design environment in Denmark. Among these initiatives is ‘Walk the Plank’, a collaboration lasting seven years between 30 furniture designers and 60 cabinet makers, all of whom donated their time and original design for a truly fine cause. There are a few ground rules the studio aims to abide by: Always start from scratch. Everything is possible until the opposite has been proven. There must be a good reason for every single decision made. Among different awards achieved by Louise Campbell, she won the IF Product Design Award in gold for “Campbell Pendant” in 2005, which she designed specifically for Louis Poulsen. 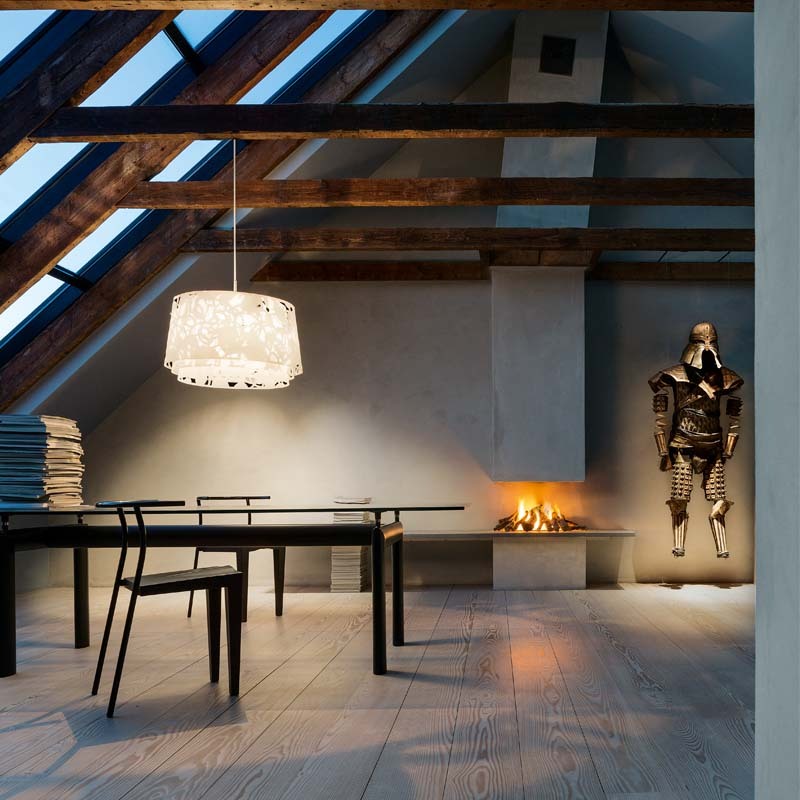 The Collage light began attracting attention back in 2005 as soon as Louis Poulsen introduced it onto the world market in cooperation with the designer, Louise Campbell. Ten years on, the Collage light fixture now hangs in homes, institutions, universities, hospitals and numerous restaurants around the world. 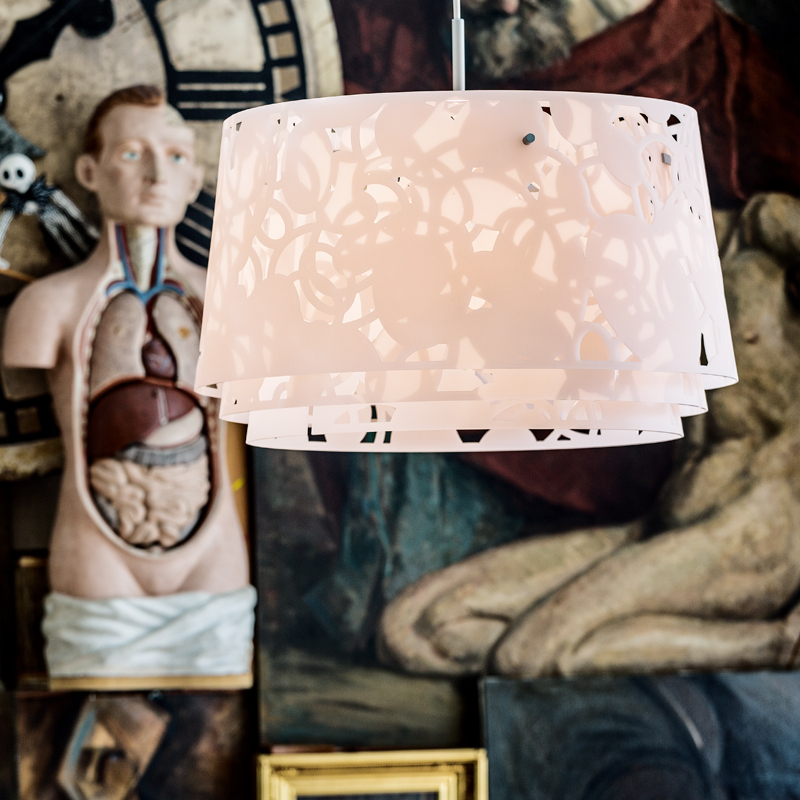 The Collage pendant is available in two sizes: Ø600 mm and Ø450 mm. The pendant's simple expression makes it very versatile above dining tables and meeting tables, or as high general lighting. Collage is available in a flexible version with an E27 fitting, which fits the LED bulbs. To further optimise lighting comfort, an anti-glare set can be purchased for the top and bottom as an optional extra. This diffuses the light directed upwards and downwards, and also inhibits direct views of the light source from all directions. Louise Campbell's inspiration from nature, translated into room lighting, has proven to be an enduring and valued design idea, which has made her name and the Collage light fixture known around the world. She has thereby proven herself to be among the key Danish designers, carrying on proud Danish design traditions in cooperation with Danish companies. Material Suspension: Natural anodised aluminium. Shades: Laser cut matt acrylic. Mounting Suspension type: Cable 2x0,75mm². Canopy: Yes. Cable length: 3m (Ø450mm) or 4m (Ø600mm).